Read about some of the latest kidney cancer news from around the world. Combination therapies for kidney cancer were exciting news this week at ESMO. Dr Hans Hammers from UTSW talks about the progress being made. Progress and challenges in biomarkers for kidney cancer biomarkers a video from Dr. Hans Hammers at ESMO. Progress and challenges in biomarkers for kidney cancer biomarkers a video from Hans Hammers at ESMO. This is an excellent article by doctors at Fox Chase Cancer Center in Philadelphia. The original article can be found in Clinical Advances in Hematology & Oncology, Vol. 16, Issue 10, October, 2018. Please feel free to share this with your doctor or caregiver. 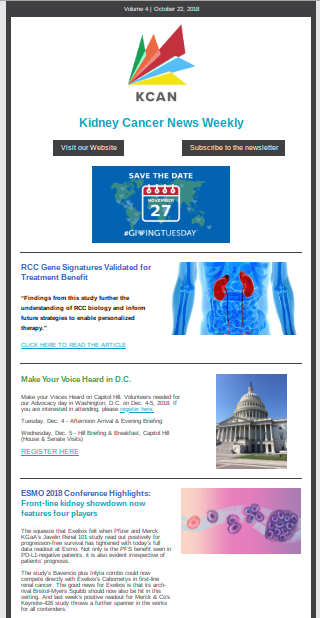 I am excited to announce our newsletter, which enables us to provide patients, survivors, and families with the latest news in kidney cancer research and treatment. Please take a look at the latest issue below and don’t forget to subscribe! On September 28th, the President signed into law the Defense, Labor HHS spending package. Included within this historic bill is the Defense Health Program that has increased the funding for the Kidney Cancer Research Program pursuant to the CDMRP from $15 million to $20 million annually. KCAN led the charge for the increase to this important program. Last week, the Senate passed by a vote of 93-7 an appropriations ('spending') conference bill package that was agreed to by both chambers to fund the Pentagon and the Departments of Labor, Health & Human Services and Education. Today, the House passed an identical bill by a vote of 361-61. This was the second of three funding bills to pass both chambers. This bill now goes to the President for signature, veto or pocket veto. The total price tag is an $854 billion spending bill that helps avoid a government shutdown This is more than 70% of our discretionary spending and is a big deal. It is the first time in over 15 years that the bills were passed on time, (according to 'Regular Order'). The bill now goes to the President's desk for signature (possibly tomorrow) and he has signaled he is willing to sign it into law. This is great for the kidney cancer community for two reasons. Deep within the Defense Department portion of the bill is the Defense Health Program which funds various medical research initiatives including kidney cancer. Through the efforts of many of us, the inaugural Kidney Cancer Research Program was signed into law last year with a funding level of $10 million. Advocacy efforts and countless DC visits over the past year resulted in a $5 million annual increase for FY'18 and just today another $5 million annual increase to $20 Million for FY'19. Today's package included appropriations, which fully funded, Labor, Health and Human Services (HHS) and Education for fiscal 2019. The bill included a $2 Billion increase for the NIH (and a significant increase for the National Cancer Institute) and showcases Congress’s ongoing commitment to medical research in which funding advances science, innovation, and economic growth. It is important to highlight several of the Congressional champions in the House. In particular, House Appropriations Committee leadership, including Chairman Rodney Frelinghuysen (R-N.J.), Ranking Member Nita Lowey (D-N.Y.), Subcommittee Chair Tom Cole (R-Okla.), and Ranking Member Rosa DeLauro (D-Ct.), for their longstanding support for the CDMRP program, including the KCRP and for increased funding for the NIH and the National Cancer Institute. In the Senate, Senator's Shelby, Blunt, Durbin and Murray were instrumental in getting this legislation passed. If you live in any of these representatives districts, please contact their offices and thank them for their support for medical research and for providing hope to the kidney cancer community. On September 18, the Senate passed the FY19 spending package that covers Defense, Labor, Health and Human Services and Education Departments as well as a continuing resolution for the remaining programs until December 7 to avert any partial shutdown. The appropriations package was carried by a vote of 93 – 7, with the dissenting votes coming from Sens. Jeff Flake (R-AZ), Mike Lee (R-UT), Rand Paul (R-KY), David Perdue (R-GA), Ben Sasse (R-NE), Pat Toomey (R-PA), and Bernie Sanders (I-VT). The House is slated to vote on the measure next week (before the end of the fiscal year on September 30). The Labor-HHS-Education division of the bill provides $178.1 billion in discretionary funding for the Departments of Labor, Health and Human Services, and Education and Related Agencies to continue investments in critical medical research, opioid abuse prevention and treatment, and education. The bill includes $39.1 billion for the National Institutes of Health (NIH), an increase of $2 billion over current funding, and $3.8 billion to combat the opioid crisis, an increase of $206 million over current funding. The bill also includes an increase to $20 million for the KCRP (Kidney Cancer Research Program) pursuant to the CDMRP (Congressionally Directed Medical Research Program). This increase came about through the combined efforts of a number of advocacy groups coordinated under the leadership of KCAN. White Plains, NY, Sept. 4, 2018--Bryan Lewis, president, Kidney Cancer Action Network, met with Congresswoman Nita Lowey at her White Plains District Office on Aug. 30, 2018. The purpose of the meeting was to both thank Congresswoman Lowey for her instrumental support in helping to secure $15 million annually in research funding for kidney cancer and review the resulting impact. This past year, an inaugural $10 million program was launched that has awarded 22 meritorious research applicants with crucial funding for this disease. The research community has been reinvigorated and this infusion of research dollars has motivated and drawn a new wave of young researchers to the field. This, in turn, has created a renewed sense of hope for a cure in the patient community throughout Westchester County and beyond. the defense health research programs, was enacted into law every year. WASHINGTON — The Senate on Thursday approved a massive spending bill that would direct more than $670 billion to the Defense Department for the 2019 fiscal year. The defense spending legislation is part of a larger labor, health and human services and education spending bill, an unusual combination, a lawmaker noted. The measure, which was part of a larger funding package of more than $850 billion that also included an increase in funding for the NIH and NCI, will fund priorities directed in the recently passed 2019 National Defense Authorization Act, which directs policy and spending plans for the Defense Department. The legislation, H.R. 6157, now goes to a conference committee made up of members from both the House and Senate and has to be reconciled with its House version before requiring votes in both chambers. If approved, the legislation goes to the president for his signature. “The funds meet many of the requirements of our military commanders, equipping and training units to meet and overcome the most dangerous of emerging global threats,” Senate Majority Leader Mitch McConnell, R-Ky., said ahead of Thursday’s vote. “As ever, our obligation to this all-volunteer force is to provide adequate training, weaponry and skills so that Americans always prevail on the battlefield.” In June, the House passed its defense appropriations measure, H.R. 6157, in a vote of 359 to 49, followed by today’s Senate passage. The defense budget moves on two tracks: the annual NDAA sets policy changes and expenditures for the military and determines how the money will be spent, while the defense appropriations bill is what actually moves money to the Pentagon to support the plan. “It probably sounds like a pretty unusual combination even though I think most voters, most taxpayers understand that to get this work done in the time frame we have to do it, we generally need to bring more than one topic together on the floor at the same time,” Sen. Roy Blunt, R-Mo., said Thursday of the combination of efforts being funded by the same appropriations bill, adding it could be on Trump’s desk by the start of the fiscal year Oct. 1. The so-called “minibus” appropriations bill saw more than two days of debate on the Senate floor this week. At this pace, it’s possible the defense spending bill could see passage by Oct. 1, which would mark the first on-time passage of the NDAA and its funding companion bill in more than 20 years. For example, Trump has threatened not to sign off on government spending plans if there isn’t sufficient money to build a wall along the U.S.-Mexico border. This, as Trump is facing questions tied to the investigation into Russian interference in the 2016 presidential election and a growing list of former administration aides facing criminal charges, which could divert attention on Capitol Hill from finishing up its NDAA funding measure on time.